*Brought to you by the producers of THE FIVE FISTINGS OF SCIENCE and HOBO DARKSEID: THE MUSICAL. Santa & Lightsabers. Help indeed. 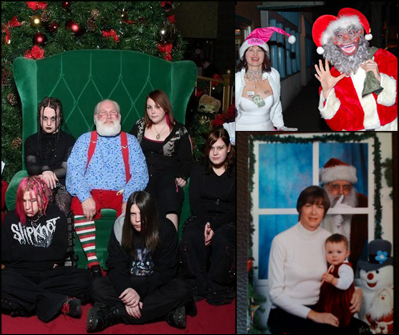 The Slipknot fan group photo there reminds me all too much of when my mother forced me (under threat of no presents) to get a Santa picture taken every single year until I was 14, 6′ tall, and showing up in corpsepaint. That was an awkward Christmas card if I’ve ever seen one. Some of these are amazing. I just can’t look at the ones at sketchysantas.com posted above, though. Must be some serious regression on my part, but I sometimes hate seeing things intended to be cute and innocent subverted this way. 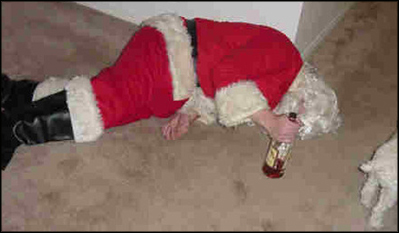 I can see how some of them seem creepy, but when it comes to santa I want to believe in the purity of their intentions. I want to belieeeeeve! It’s like when I was younger and getting to be too old for stuffed animals and my friends would come over to my house and throw my stuffed animals around, and I had to laugh and pretend it was okay, when I was secretly crying inside because they were being mean to my childhood animals. Sketchysantas makes me feel like that.